Welcome to the lighting gallery website where we aim to give you just a taste of the very extensive range of light fittings that we hold in stock in our Higham, Suffolk- based lighting showroom. If you are looking for light fittings from stunning contemporary lighting, traditional lighting, lamps, floor standing lights, energy efficient lighting, through to exterior lighting, kitchen and bathroom lighting and of course, a wide variety of tasteful lamp shades, all found within what is probably the largest lighting showroom in East Anglia; then you have come to the right place. Our superb 3500 sq. ft lighting showroom extends before you, so that you can enjoy the ambience and excitement generated by lighting designs and styles to match every taste and all designed to help you create the perfect atmosphere and mood for your home or business. Unlike many standard lighting shops we want you to enjoy the lighting gallery experience so encourage you to soak up the atmosphere, enjoy a coffee with us, relax, spend as long as you like and take as little or as much help from our fully trained and experienced lighting advisors. With ample free parking right outside our door and the Suffolk and Cambridgeshire countryside right on the doorstep, forget the pressures of everyday living and plan your dream lighting. Easy access just of the A14 and situated between Bury St Edmunds and Newmarket. 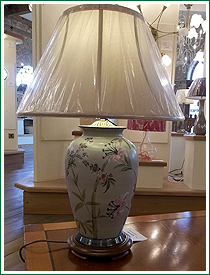 Lighting gallery, lighting shop, lighting showroom, Higham, Newmarket, Bury St Edmunds, Suffolk, Cambridgeshire, Huntingdon, Thetford, Norfolk, light fittings, lamps, outdoor lights, LED's, lampshades, bulbs, low energy lighting.